Busy! Busy! Busy! Still only September but the students have accomplished many things already. On Monday the students finished their first unit in math with a test on factors and started a new unit on Wednesday. The test on factors will come home on Friday. The new unit is called Estimation and Computation. In reading, the students have been reading independent books, as well as books as a group. Students are reading stories about sports, dogs and the great outdoors. We have started to talk about setting, character, main idea, problem and the outcome of a story. The students have started to draft their first stories in writing class. You may be hearing such vocabulary as “seed ideas,” rewriting, editing, and publishing. Scholastic orders and pictures are due tomorrow. Book fair is coming in October. Information about that will come home on Friday as well. 1. The students met with their first grade buddies on Monday. They did a great job making them feel welcome. 2. The students walked out of the school during a fire drill with their buddies. Everyone was calm and followed the directions during the fire drill. 3. The students have been focused and sharp during their specials. 4. The fifth graders are back to playing football at recess time because they are following the playground rules. Next week the students start the Global Read Aloud reading “The One and Only Ivan.” This is something new for me and I am looking forward to it. Book Order due Friday, September 28th. Back to School Dance Friday, September 28th. Global Read Aloud Starts Monday, October 1st. Scholastic Book Fair Monday, October 8th through Thursday, October 11th. Picture Re-Take Tuesday, October 16th. Harvest Party Wednesday, October 24th 10:15 AM. CRT Early Release Wednesday, October 24th at 11 AM. No School Thursday, October 25th and Friday, October 26th. Today I had the pleasure of coming in and teaching the students about Edmodo.com, as well as give them their new pedometers. The pedometers will be used for the Global Childrens Challenge, which starts tomorrow September 19th. The premise is very simple: students wear the pedometers for 50 days, track their footsteps and report them to me through Edmodo. I then log them on the website where we progress through "the world" as our steps are counted. The challenge was created to get kids up and moving since 15,000 steps is the recommended amount for children this age. I will be wearing one as well and look forward to this first global challenge with the students. Edmodo is a great secure social media platform that I explained in the technology letter. We also refer to it as a "safe Facebook" in that students get to post on their wall, but only publicly, as well as have a profile. We will be using Edmodo to communicate as a class, as well as to communicate with our partner class in California during the Global Read Aloud. For now the students get to be more unstructured on our class page, once I am back in the classroom, we will discuss better ways to utilize the tool. We are so excited to be starting a new school year! There is much to be excited about. The students did complete the PBIS (uniform rules and policies that the entire school district go over and work on) program last week and have already finished some experiments in science units, and started new writing and reading programs. This week the students are being tested and placed in reading and math groups. Math did get started on Monday. We had a bus safety program on Wednesday. Picture day on Friday September 21. Getting to know our classmates a little better including Ethan who is new to our school this year. Mrs. Ripp coming in on Tuesday to explain Edmodo and setting up their accounts for the Global Read Aloud. More experiments in our science unit. Scholastic orders will soon be sent home. Reading groups established and beginning. Getting better at our math facts. Getting to know our new principal Mr.Macklem. No more testing for awhile!!! Please click on the Volunteerspot button to sign up for your fall conference. 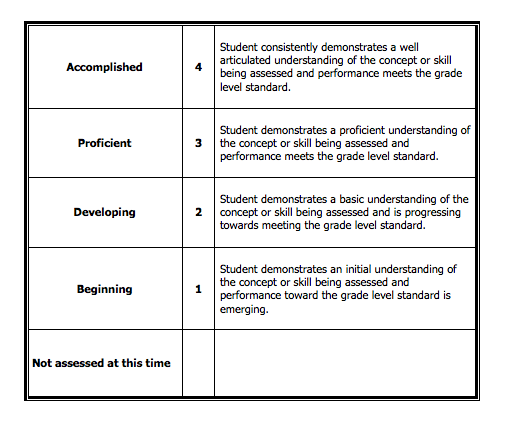 This is a draft of the new report card rubric for MCPASD. Letter grades will no longer be on report cards but instead a 1-4 assigned to better communicate student growth and needs.